is my SDL low on pollution ? Leak down test is not to check cooling system integrity if I understand correctly. It is to check the rings and cylinder wall. Also it is only 20psi. Am I missing something? No way you will see air bubbles at 100psi, even much more. He is checking for a cracked head where combustion gases are finding a way to the coolant hence the hard coolant line ober night. 100 psi is used to make hearing or seeing the leak more pronounced. Please read up leak down test. If you see bubbles at 100psi the head is a goner and I doubt the car can be driven as described by OP. What is the pressure when combustion happens? Not MBZ nor A/C trained professional but a die-hard DIY and green engineer. Use the info at your own peril. Picked up 2 Infractions because of disagreements. NOW reversed. 1 x 84 190D ( 5 sp ) - All R134 converted + keyless entry. Did the engine see a lot of heat? Because if it didn't the head isnt just going to magically crack. You probably just have a bad head gasket. I'm so confused on your post as well.. Why are you concerned about pollution? It was good in its time, but with all the green freaks and modern cars it's most certainly not up to standards. But if that's your concern, I wouldn't mind buying an SDL if it's clean otherwise. Lisle 75730 is labeled for Diesels. 75630 isn’t. 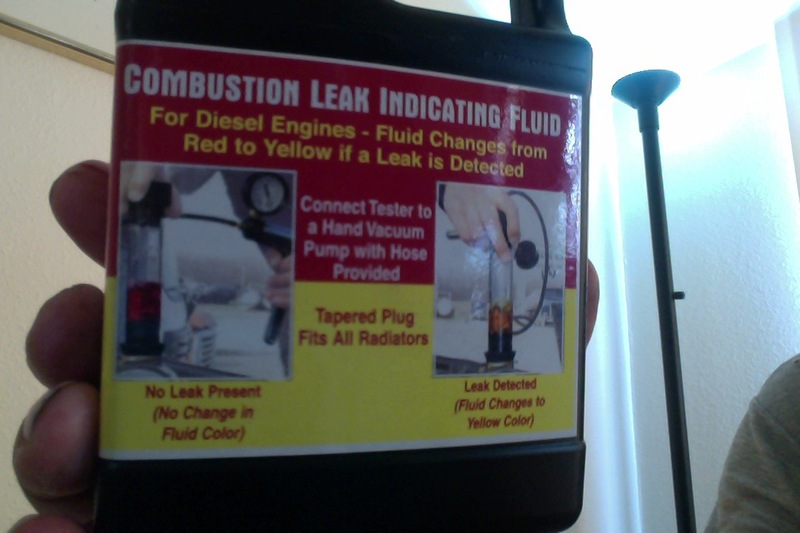 But you mentioned red fluid which is for Diesels vs blue for... it doesn’t say. How did you get test fluid into the combustion chamber? There is no engine vacuum to draw it as the instructions suggest. One temporary trick is to leave the pressure cap only on the first latch, not fully closed, so cooling system cannot build pressure. Cooling capacity is reduced so watch the temp gauge but coolant can flow better because the pump isn’t fighting full pressure all the time. Please listen to 40 + years of experience building engines. Any experienced engine guy knows what I'm talking about. A leak down test encompasses more than just piston rings. We don't care about leak down percentages in this case, just if the air ends up in the cooling system. 100 PSI is typical and plenty in finding a combustion chamber to coolant leak that means anything. In fact, if you get a cylinder head pressure checked at a machine shop, they to use 100 ish PSI. I generally fill the rad to the top then look for the level to rise. If the level goes up, there is a slight leak. Bubbles are a sign of a larger leak. I've worked on engines that used a qt of water every 4,000 miles, when doing a leak down, the level would slowly rise. A qt every 4,000 miles is very slight and the leak down test found it. Any rise with a pressurized cylinder = combustion chamber to coolant leak. This could be from a failing head gasket / cracked head / cracked cylinder. Thanks for the enlightenment. What i meant is seeing bubble is very serious. Is a qt every 4000 miles acceptable? I really don't think the OP has a serious issue and warrant a head removal, IMHO. Don't touch it. Just enjoy the car. the saying here applies.. "if it ain't broke don't fix it"